Here are some frequently asked questions ( FAQ s ) about Alumawood patio covers. A: It is the Official Brand name of the originator in aluminum “simulated wood covers”, Alumawood™ is available in Solid Roof Newport Patio Covers and Open Roof Laguna Arbor Lattice Covers. Q.) What colors does Alumawood have? A: Current there are 7 colors: White, Desert Sand, Spanish Brown, Adobe, Mojave Tan, and Sonora Beige. note: Spanish brown is not available for the roof. Q.) Do you have to paint Alumawood patio covers? A: No, Alumawood patio covers come with a baked on enamel finish that will keep your patio’s paint looking great for the life of your Alumawood cover. Q.) Can you hang a fan from an Alumawood patio cover? A: Yes, a reinforcement bracket (or fan beam) can be installed with Alumawood Solid and Lattice covers to support the weight and conceal the wire of the installation of a fan. Q.) How many colors are available for Alumawood Patio Covers? A: Currently 7; White, Desert Sand, Mojave Tan, Sonora Beige, Latte, Adobe, and Spanish Brown. Q.) Do you need footings for the post on an Alumawood Patio Cover? A: Yes & No. Yes, if you are doing a freestanding patio or inserting steel to widen your post spacing. No, if you build within specifications of Alumawood guidelines. A normal 3″ slab of concrete will work just fine. Q.) Can you walk on an Alumawood Patio Cover? A: No, Alumawood patio covers are designed to create shade and are not recommended to be walked on. Q.) Are Alumawood Patio Covers hollow? A: Yes, the aluminum is extruded from a machine to make the different sizes used to build Alumawood Patio Covers. Although, Styrofoam is inserted into the posts for additional strength allowing wiring from electrical to be hidden easily inside the hollow space of the material. Q.) How can I hang things from Alumawood Patio Covers? A: There is actually a product called the Alumahanger that allows you to hang plants, wind chimes, and other items from your Alumawood patio covers without making holes or causing damage. Q.) What kind of end cuts do Alumawood have? A: There are 4 different end cuts; Mitered, Flat Beveled, Corbel, and Scallop. A: Yes, there are a few different way depending on your roof but here is a link to one example. A: No, Alumawood is aluminum that has been embossed with wood texture and the paint is baked on enamel with a Teflon finish. Q.) Can an Alumawood patio be built in one day? A: 1daypatios.com is your solution. Q.) Where can I buy replacement parts for my Alumawood patio? A: There is actually a great place online you can visit called AlumawoodProducts.com. Q.) Can you use columns with Alumawood? A: Yes, standard columns are 8″ or 10″ circumference with either smooth finish or fluted. Custom columns such as square, foam stucco, block or wood can also be used as long as they meet specifications. Q.) Why should I get a new patio cover? A: If you current patio is rotten, falling apart, or you just can’t stand looking at it anymore. It may be time to look into new patio covers. Or just tear down the old one and wait until you are ready for something new. Q.) How much does it cost to tear down a patio? A: The price to tear down an old patio really depends, but a good price to would be around $1.00-$2.00 a square foot. Q.) Where can I check for ideas about Alumawood patio cover? Q.) Are Alumawood Patio covers water proof? A: No, in my professional opinion after 14 years and over 1500 hundred covers I can safely say water resistant is a better term. Even the best installer can only give you 99% water protection. In moderate rain you will be fine but in a heavy rain storms you will see water find its way around stucco, calking, gaskets, and wood. In most cases you are fine but houses with stucco the water can go through cracks and around ledgers after multiple days of heavy rain. Alumawood patios are “shade structures” but do stop 99% of the water from getting through. The 1% almost always happens at the ledger, and in most cases 2 story stucco walls. Q.) Can you install recessed lighting on Alumawood? A: Yes, each recessed light is custom installed on site during the build. Also, know as canned lighting. Ask us about getting recessed lighting on you free estimate and we will give you all the options. Q.) Do you have any contractor buddies for General, concrete, or landscaping? A: Yes, please visit our contractor buddies page. Q.) What is a Plot Plan? A: Plot Plans are used when pulling a permit to show the dimensions of you property and patio covers? Q.) Can an Alumawood patio be built in a day? A: Yes, here is a link to 1daypatios.com which has pricing and sizes for patios that take only one day. Q.) Do aluminum patio covers need ledgers? A: Yes, and depending on your city you may need a ledger inspection before building your patio cover. Q.) How can I order an Alumawood patio kit and build it my self? Q.) 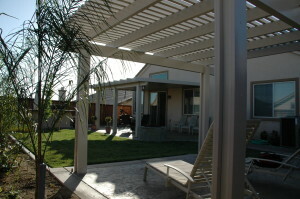 How do you build an Alumawood patio cover when you have pavers?